Recently I’ve been looking through medieval recipe collections for remedies and tests relating to infertility, the subject of my new research project. At first I was looking for any remedies, from the fairly mundane (mares’ milk) to the ones that look more exotic, at least to modern eyes (numerous animal testicles and a few charms) but recently I’ve taken a more targeted approach, comparing the different manuscripts of a single recipe collection to see if the infertility recipes change as the collections were copied. I’m hoping that these changes will tell me something about the priorities of the various different copyists and owners of the manuscripts, and so shed light on how infertility remedies may have been used in practice – or at least, how the scribes who were paid to copy collections of recipes thought they might be used. Monica Green has taken a similar approach to manuscripts of gynaecological texts in her book Making Women’s Medicine Masculine. I started this when I noticed that a few collections included recipes which assumed the man would take a role in seeking or administering a cure for infertility. 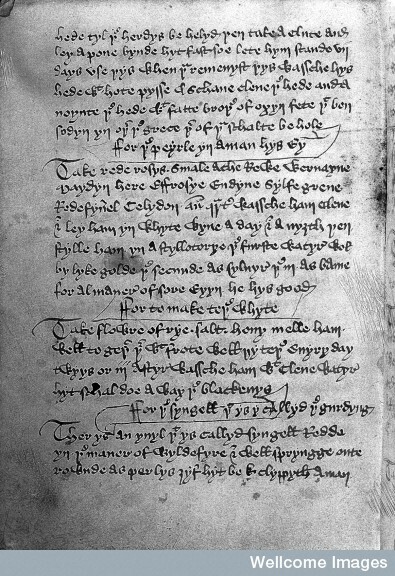 For example one recipe to aid conception in the Liber de Diversis Medicinis (Book of Diverse Medicines), an English recipe collection published by Margaret Ogden from a fifteenth-century manuscript, opens with the heading ‘If a man will that a woman conceive a child soon.’ This interested me because it’s often assumed that in the Middle Ages infertility was seen as a female condition and women therefore bore much of the responsibility for seeking treatment, and yet here we have the suggestion that a man might take the initiative in seeking a remedy. I wondered how typical it was. One way to find out was to look at the other manuscripts and see if they kept the same heading, or substituted a different one. Another manuscript again (British Library MS Sloane 962) included a recipe for conception in Latin alongside the English ones. 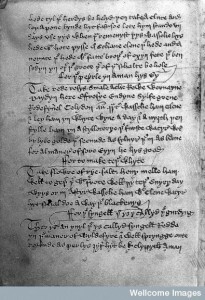 Switching between languages is not unusual in medieval recipe manuscripts but it still tells us something about the scribe and the person who owned it – both had at least a basic knowledge of Latin, the language of university medicine, which suggests this manuscript is more likely to have been aimed at a male medical practitioner than an interested amateur. So far, though, I haven’t found another manuscript which includes Ogden’s heading, aimed at a man who wants a woman to conceive, so perhaps the idea that a man might take the initiative was unusual after all. I’m still thinking about what all this means and how significant these variations are. In some cases variations may be the result of missing pages in a manuscript, or simple miscopying. Even when they are not, it is difficult to tell how far scribes were consciously making these changes in order to adapt the text to the needs of a new reader – one who could read Latin, for example, or one who imagined that men would come seeking help to make their wives conceive. However, in most cases these manuscripts do show us scribes who did not copy blindly, but rather were familiar enough with recipes to change things in ways that made sense to them. By tracking these variations I’m hoping to uncover as many medieval attitudes to infertility and its treatment as possible. Monica Green, Making Women’s Medicine Masculine (Oxford: Oxford University Press, 2008). The Liber de Diversis Medicinis in the Thornton Manuscript (MS Lincoln Cathedral A.5.2)¸ ed. Margaret Sinclair Ogden, Early English Texts Society original series 207 (London: Oxford University Press, 1938), p. 56. London, British Library MS Royal 17.A.VIII, f. 63v. Thanks both – my plan is to do a lot more of this and turn it into a paper eventually!